LE BAR offers light breakfast options from 4 to 6.30 A.M. plus round the clock snack service. Bartending service is also available from 12 P.M. to 11 P.M. Very conveniet and nice location! The rooms are the same as the HK hotels where space is a premium but this Hotel has the standard in cleanliness and professionalism. What is not advertised to their disadvantage is that this Hotel is on the ROUTE of H2 free shuttle bus from the HK Airport Express Central Station. The free shuttle is every 20mins and so convenient as is just right outside the hotel. For those who are into shopping, this is a great location for those into dried seafood, mushrooms etc. Great quality! The location is great for all sorts of shopping and with laundry shops, money exchange and also a cooked food market nearby. There is also a Tram line just outside the hotel where you can get a nice day doing city tour by hopping onto the tram and doing HK island from one end to the next. I was even upgraded to a high floor room with a view of the water front. What a nice feeling on the high floors over looking the seafront! Our stay was awesome, staff are very friendly, food are in very good quality and tasteful, rooms was cleaned, last but not the least location is great it is nearby to all. Excellent stay and service. Thanks to all staff, room cleaning, dinning especially. Great Food ever day. Amazing IBIS Thanks very much. Convenient location plus the view. Friendly and helpful staff. Spacious room and is being constantly cleaned up. Amazing food (bfast buffet). I think the only thing that troubled us was the socket. We had a problem charging our phones bcos the socket doesnt match with our charger and our adaptor on hand. So we had to request an adaptor from the hotel. The response was prompt but only lend us one so we cant charge our gadgets altogether and had to wait til one finishes. We often get to leave the hotel with our phones not full and for us who went to HK for vaca and constantly need photos, thats a problem. But aside from this, everything’s . The room is super small & no privacy. The next door building can see us and we can see them. The laundry facility costs so much money. We have to do 2 cycles each for washer & dryer. Very expensive for the given quality. I found other options much more convenient than this hotel in Hong Kong. The hotel was clean and secure which was all I needed. Very small room, but did the job for our weekend. Great hotel, wonderful staff, but very hard bed. If the bed had been better, we would give this hotel 10 out of 10. But for us, the bed was so hard that we couldn't get a good sleep. For us, that will mean that we would not stay here again. Apart from that, we thought it was a great hotel. The room was small, but not too small, and very well equipped. Everything was clean and well maintained. The staff were wonderful - we had several interactions with them and they were always friendly, upbeat and helpful. They did their best to help us with the hard bed by arranging for a mattress topper - this didn't make much difference to the mattress, but the attempt was made quickly and with a smile. The hotel's location was great, close to all forms of transport, and plenty of dining and shopping near by. price was okay. Locations was okay. Entire building especially the room is very humid and stinky a bit. We had to put A/C on all night to get rid of that humidity and smell that comes from it. Didn't help, even the A/C had this humid air and it got me sick. Staff was nice and other than that, it was clean. The hotel is situated in the central Hong Kong near all the trasportation station of the Tram, Star Ferry, and MTR, so it is very easy and convenient to travel around in Hong Kong and to Kowloon. 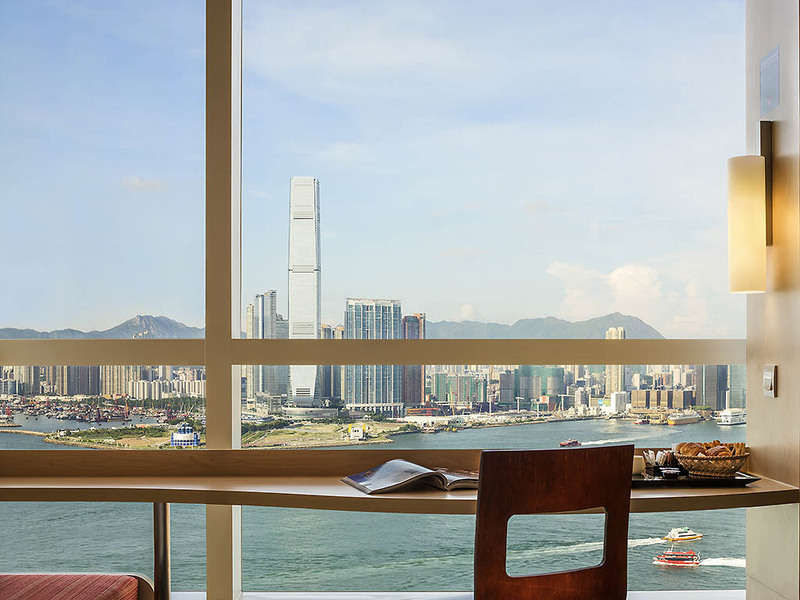 My bedroom is on the 29th floor, it is clean and fully equipped with an excellent full view of Victoria Harbour and the Kowloon side. The staff was very efficient, friendly and helpful in booking a tour, explaining how to travel around as well as booking a transfer to the airport. The breakfast buffet, covering western, asian and local chinese dishes, was very delicious. If I visit Hong Kong again, I will stay at IBIS Hong Kong Central & Sheung Wan again. it was a nice experience but ut would be great if service comes with included breackfast package. I had a pleasant stay while in Hong Kong. Staff were friendly and helpful. Hotel is in a good location. Room was fairly basic, but satisfactory.